What Are Alternatives To Removing Letting Fees? With all the talk about letting fees; I want to dispel the myth that we are solely working for the landlord. Like any business owner, we value good customers and work hard to look after them, and make sure they are happy. Without tenants and owners there is no rental market or places for people to live. It is true that we are filling an empty property for an owner, but we are also offering a home to a tenant. The property manager is kept pretty busy when a property is vacant – they meet tenants at the property and show them around, discussing features, neighbours, schools and upcoming maintenance or improvements. We feel this information is important for someone making a decision whether to make this their home or not, and we go out of our way to find as much information so we can to help with that decision. The property manager also holds viewings on a regular basis for tenants to look at several different properties so they can compare quality, location, size, schools etc. A lot of people come to viewings even though they are not going to take the property. They use this as an opportunity to do a comparison, not only to find a new home but also to compare where they are currently staying. As a property manager we are happy to work for tenants and help them decide on a home, as not every property is for everyone just because it’s a roof over their head. We also assist our tenants, especially the elderly or first time renters, sorting out essential things like utilities and fibre internet. Regardless of who people think should pay, this work is being done and that person does need to get paid, just like anybody else going to work. The proposed change to remove the letting fee altogether will impact on rents and will result is an increase of at least $10 a week. Although removing the equivalent of an extra weeks rent on move in may seem a good thing, every person who stays in a property longer than a year will be paying more. According to research from the Property Investors Association; the average person stays in a property 2 years and 3 months, which will cost them approximately $500 more than paying the current letting fee. Paying off a letting fee over time – simply divide the letting fee into an interest free plan; and pay every week with the rent until it is paid off. Make it a set fee, rather than a week’s rent – this will give clarity on how much people are paying up front, it could well reduce fees on high rent properties, but may well force an increase on low rent properties, which will affect those who can least afford an increase. This would possibly result in a reduction on the amount of viewings available to tenants, and also reduce the flexibility a manager may be able to offer with their time. This also raises issues with who sets this fee – does legislation dictate what this would be or do market forces do this? Or would it be tied to some industry measurement such as current average rents? 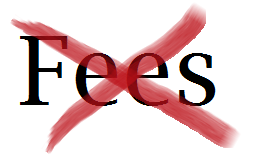 Set a maximum fee so that Property Managers can set their own fee to cover their costs – this fee would be disclosed to tenants up front in all advertising – but tenants would know that the fee on any property could not go above the set maximum. Again, this raises the question on who sets this maximum and how they will determine what it should be. Private landlords are already unable to charge letting fees, and research also states that this is approximately 50% of the rental market; so options already exist to people on a lower budgets or that just don’t wish to pay a letting fee. Either way, the Property Manager does need to be paid for the time and effort that they put in to securing a tenant for the landlord, and thus providing a home for the tenant.